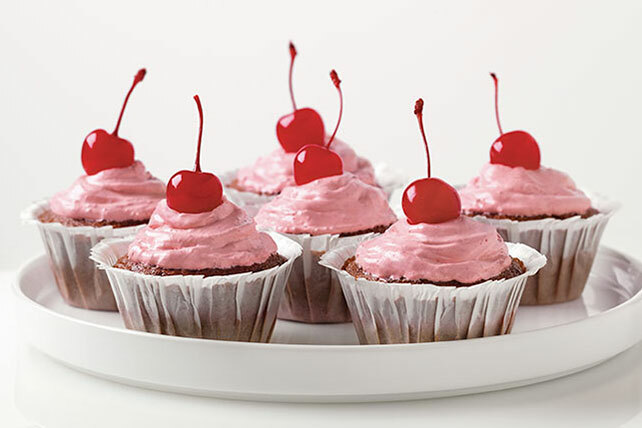 Discover the easy way to make sumptuous Black Forest Cupcakes. This video covers it all—from the chocolate cake mix to the maraschino cherry on top! Add boiling water to gelatin mix in medium bowl; stir 2 min. until completely dissolved. Refrigerate 15 min. or until slightly thickened. Whisk COOL WHIP gradually into gelatin until well blended. Spread onto cupcakes, using about 2 Tbsp. for each. Top with cherries just before serving. Prepare using a yellow cake mix and JELL-O Orange Flavor Gelatin. Substitute twisted orange slices for the cherries. Prepare using a white cake mix and JELL-O Lemon Flavor Gelatin. Substitute twisted lemon slices for the cherries. Prepare using your favorite flavor of JELL-O Gelatin and a garnish of your choice. Prepare using 1 pkg. (0.3 oz.) JELL-O Black Cherry Flavor Sugar Free Gelatin and COOL WHIP LITE Whipped Topping.